Yellow fever virus is found in tropical and subtropical areas in South America and Africa. The virus is transmitted to people by the bite of an infected mosquito. 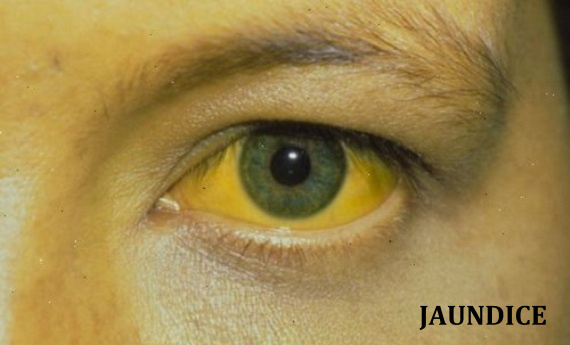 Yellow fever is a very rare cause of illness in the UK and US travelers. The illness ranges in severity from a self-limited febrile illness to severe liver disease with bleeding. Yellow fever disease is diagnosed based on symptoms, physical findings, laboratory testing, and travel history, including the possibility of exposure to infected mosquitoes. There is no specific treatment for yellow fever and care is based on symptoms. Steps to prevent yellow fever virus infection include using insect repellent, wearing protective clothing, and getting vaccinated. • The majority of persons infected with yellow fever virus have no illness or only mild illness. • In persons who develop symptoms, the incubation period (time from infection until illness) is typically 3–6 days. • The initial symptoms include sudden onset of fever, chills, severe headache, back pain, general body aches, nausea and vomiting, fatigue and weakness. Most people improve after the initial presentation. • After a brief remission of hours to a day, roughly 15% of cases progress to develop a more severe form of the disease. The severe form is characterized by high fever, jaundice, bleeding, and eventually shock and failure of multiple organs. Yellow fever virus is an RNA virus that belongs to the genus Flavivirus. It is related to West Nile, St. Louis encephalitis, and Japanese encephalitis viruses. 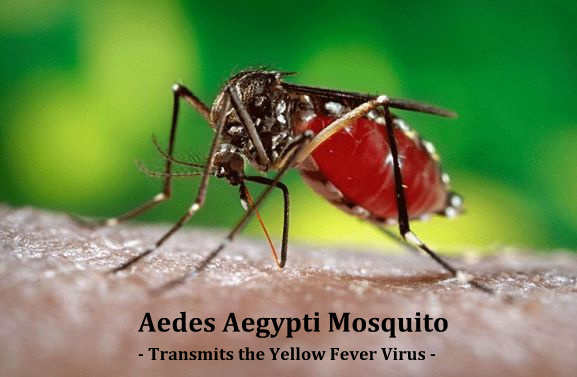 Yellow fever virus is transmitted to people primarily through the bite of infected Aedes or Haemagogus species mosquitoes. Mosquitoes acquire the virus by feeding on infected primates (human or non-human) and then can transmit the virus to other primates (human or non-human). People infected with yellow fever virus are infectious to mosquitoes (referred to as being "viremic") shortly before the onset of fever and up to 5 days after onset. 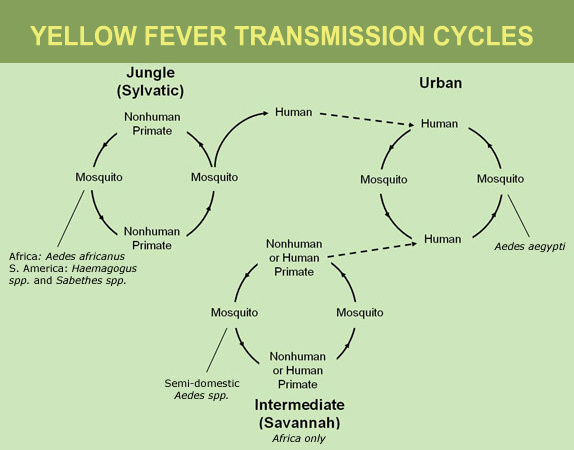 The jungle (sylvatic) cycle involves transmission of the virus between non-human primates (e.g., monkeys) and mosquito species found in the forest canopy. The virus is transmitted by mosquitoes from monkeys to humans when humans are visiting or working in the jungle. In Africa, an intermediate (savannah) cycle exists that involves transmission of virus from mosquitoes to humans living or working in jungle border areas. In this cycle, the virus can be transmitted from monkey to human or from human to human via mosquitoes. The urban cycle involves trans­mission of the virus between humans and urban mosquitoes, primarily Aedes aegypti. The virus is usually brought to the urban setting by a viremic human who was infected in the jungle or savannah. • No specific treatments have been found to benefit patients with yellow fever. Whenever possible, yellow fever patients should be hospitalized for supportive care and close observation. • Treatment is symptomatic. Rest, fluids and use of pain relievers and medication to reduce fever may relieve symptoms of aching. • Care should be taken to avoid certain medications, such as aspirin or other nonsteroidal anti-inflammatory drugs (e.g. ibuprofen, naproxen), which may increase the risk of bleeding. • Yellow fever patients should be protected from further mosquito exposure (staying indoors and/or under a mosquito net) for up to 5 days after the onset of fever. This way, yellow fever virus in their bloodstream will be unavailable to uninfected mosquitoes, thus breaking the transmission cycle and reducing risk to the persons around them. • The majority of infected persons will be asymptomatic or have mild disease with complete recovery. • In persons who become symptomatic but recover, weakness and fatigue may last several months. • Among those who develop severe disease, 20–50% may die. • Those who recover from yellow fever generally have lasting immunity against subsequent infection. Yellow fever vaccine is recommended for persons aged ≥ 9 months who are traveling to or living in areas at risk for yellow fever virus transmission in South America and Africa. Yellow fever vaccine is a live-virus vaccine that has been used for several decades. A single dose provides lifelong protection for most people.